Non-Tuberculous Mycobacteria: Passengers or Pathogens? Background The frequency of clinical isolation of non-tuberculous mycobacteria (NTM) from the respiratory tract is increasing. American Thoracic Society (ATS) criteria aid the identification of clinically relevant isolates causing lung disease. Methods records of all patients from whom NTM were isolated from respiratory samples between 2007 and 2014 were reviewed. Microbiological results, radiological findings and symptoms were reviewed to assess adherence to ATS diagnostic criteria and outcomes. Results NTM were isolated 826 times in 444 clinical episodes during the study period. Of 92 treated episodes, 81 (88%) met diagnostic criteria. If isolated, M. abscessus was most likely to be clinically relevant [Figure 1] and sputum smear positive. Isolation of M. kansasii and M. malmoense also warrant particular attention. Of the cases meeting ATS diagnostic criteria, the most common symptoms were fever, night sweats and weight loss. Concomitant oral steroid use and HIV positive status were common in this group. Cavitation and tree-in-bud were the most common CT radiographic appearances. Discussion 21% of all clinical episodes with NTM isolation were treated for NTM disease. 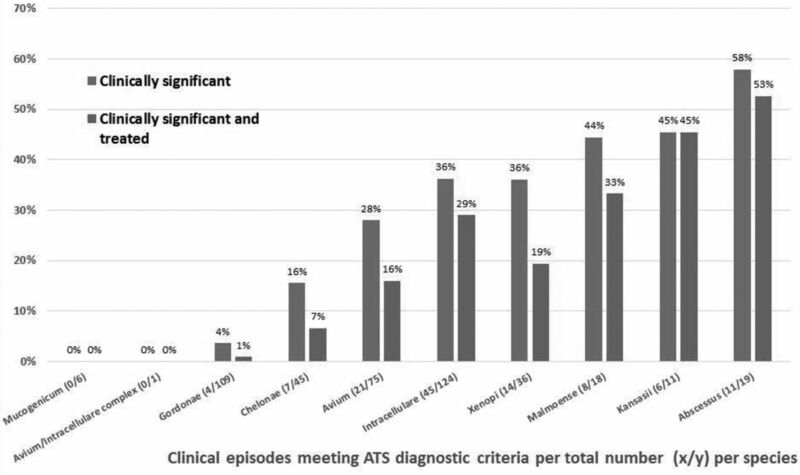 88% of cases met ATS diagnostic criteria suggesting good adherence to guidance. Griffith DE, et al. An Official ATS/IDSA Statement: Diagnosis, Treatment, and Prevention of Nontuberculous Mycobacterial Diseases. Am J Respir Crit Care Med 2007;175:367–416.